The universe is expanding for now, like a cake rising, and think of galaxies moving away as raisins in the cake moving further apart. The galaxies outside of our own are moving away from us, and the ones that are farthest away are moving the fastest. The rate of expansion is called Hubble Constant, H0 which currently stands as 74 Kilometers per second per 3 million Kilometers or little less than 2 million miles. How long this process will go on, there are three scenarios, 1) universe will expand forever, 2) it may come to a balanced state and stop expanding and 3) the expansion is halted and it begins to shrink again to the point where it all started from. There is a tussle between dark energy of the universe and the gravitational pull of the dark matter in it. The dark energy is winning for now and there is a strong consensus among cosmologists that the universe is "flat" (see Shape of the universe) and will continue to expand forever. Expanding universe tells us that at one time it must have been very small. how small? As small as the period at the end of this sentence. With all the energy and matter squeezed in this tiny spot it must have been very hot. Then all of a sudden there was a Big-Bang, the concentrated matter and energy started spreading all around. The energy with no effect of gravity spread evenly (this energy from the early expansion is still with us in the form of Cosmic Microwave Background radiation and is visible through radio telescope), but the force of gravity effected the matter and started to pull matter into clumps that latter formed into galaxies. The matter cannot be seen by itself unless it emits light due to energy conversion. The stars we see emit light as a result of nuclear reaction, whereas planets such as earth and moon reflect light that falls on their surface. The oldest light we see is about 12 billion years old coming from the matter that must have moved farthest away after the big bang. This light is in the frequency range of mainly radio waves and X-Rays. These are quasar and considered as the final stage of matters as it evolved from big-bang. The universe is changing moment to moment, new stars are born and older ones die, it is happening all around us. From our view point on earth these changes are imperceptible, the spread of 74 kilometers/sec for every 3 million kilometers barely puts a dent in the line of sight, but we see this through past light as pages of history reaching us now. Stars are born in galaxies with huge dust clouds and gases called nebulae. Over time, some of the hydrogen gas present in nebulae clump together by the force of gravity and start spinning around. The spinning cloud attracts more surrounding gases and its temperature rises as atoms collide. Millions of years later, the temperature rises up to 15,000,000oC and nuclear fusion begins. This is when the nebulae begin to emit light and a new sun is born which we call a protostar. The fate of the star is determined at its birth. The size of the star depends on how much mass it contained at the start of nuclear fusion. For the first few billion years of a star’s life, the continued fusion of hydrogen atoms keeps its light shining brightly. Fig 1.7a. Our sun flares up. Photo by NASA. Over time as hydrogen fuel burns, hydrogen changes to helium and as a result star shrinks in size. The core of the star is now mostly helium but the outer shell is still hydrogen. As the core continues to shrink, it heats up the outer shell and expands the surrounding hydrogen. The outer shell cools off as a result of expansion and the star becomes a red giant. Red giants are called red because they emit red light as a result of their cooler temperature. Fig 1.8a. Star Camelopardalis a red-giant (Photo by NASA). As time goes by, hydrogen continues to burn which creates more helium in the core and as such the temperature continues to rise. At 200,000,000o C, the helium atoms fuse together to form carbon atoms. Whatever hydrogen is left forms a ring around the core. The ring is called a planetary nebula. Without nuclear fusion the star slowly cools off. The last of the helium atoms turn to carbon and the star begins to die. Gravity causes whatever matter is left to collapse inward and the star shrinks. The matter inside the star is very dense but the star is not dead yet because it still emits some white light and is now called a white dwarf. Eventually, all the energy dissipates and the star fades away. 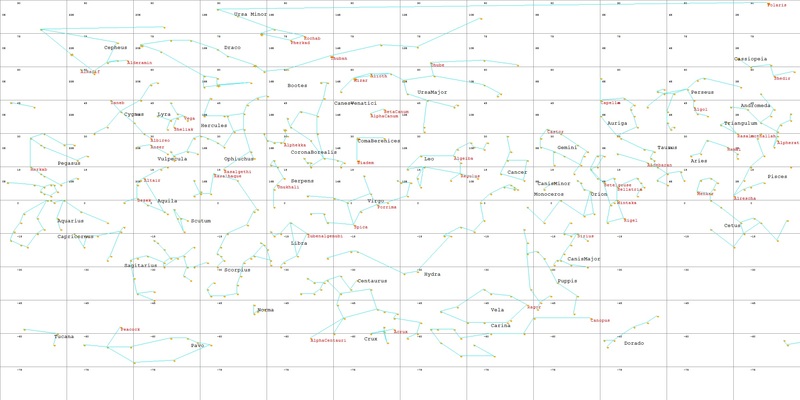 This is the fate of most small to medium size stars. Our sun is considered a medium size star. But for massive stars that are about six times the size of our sun, their fates change drastically. They start out just like a medium size sun and go through the burning process. However, at the red giant or super giant stage, the force of gravity is so great and the core is so tight that the temperature reaches up to 600,000,000o C. The carbon atoms begin to fuse and form heavier atom such as oxygen and nitrogen. At even higher temperature iron begins to form in the center. Fig 1.10. large Magellan cloud, (Photo by NASA). No further fusion can occur when iron is present in the core, but iron continues to absorb energy and as such the temperature can rise up to 100,000,000,000o C. Finally, the star has too much energy in too small a space and it bursts in a tremendous explosion called a supernova. Seen from the earth, the explosion lights up the sky for weeks and looks like a million suns shining together. Fig 1.11. Supernova explosion in the large Magellan cloud (as seen by Hubble telescope). The explosion sends debris from the star’s core and surrounding gases out into space and a new nebula is formed. The debris also contains heavier elements like gold and platinum, since at this temperature iron atoms starts fusing together and create newer elements. From this new nebula new stars are formed and cycle begins all over again. If the original mass of the sun was six to thirty times greater than the explosion may leave behind a core called a neutron star that is so dense that its size is few kilometers but as massive as our sun. Neutron star spins rapidly and gives off energy as radio waves. Young neutron stars before they cool can also produce pulses of X-rays when some parts are hotter than others. These are called a pulsar. Below is the picture of Crab Nebula having pulsar in its center. Stars over thirty times greater than mass of the sun die in a very strange way. After the supernova explosion the gravity in its core is so great that even light cannot escape. The core is called a black-hole. It can swallow matter and energy like a giant vacuum cleaner and nothing comes out of black hole, not even light, X-rays or any other electromagnetic radiation. These black-holes cannot be observed directly, instead, we infer the presence of black holes and study them by detecting their effect on other matter nearby. Fig 1.13. Black-hole in the process of devouring nearby star. If a black hole passes through a cloud of interstellar matter, it will draw matter inward or if a normal star passes close to a black hole, the black hole can tear the star apart as it pulls it toward itself. As the attracted matter accelerates and heats up, it emits x-rays that radiate into space and is detectable on earth. Fig 1.14. Intense X-ray flares thought to be caused by a black hole devouring a star (photo by NASA). Thus, the universe is a graveyard as well as a nursery of suns. One day our sun will die but there will not be a supernova, its mass is not large enough. It will simply be a red-giant expand to the size that will engulf Jupiter and then collapse into a white-dwarf. For now, we don’t have to worry about it, our sun is still young and have plenty of hydrogen to keep us warm for the next few billion years. Finding the distance of a star is a tricky matter. It is easier to measure the distance of a closer star as there will be an apparent change of its position every six months. The star position hasn’t changed, it is us who went around the sun to the other side and found a different angle. This is called parallax as shown in the Fig. Knowing the angle of observation and the distance of earth from the sun we can apply trigonometric rule to compute the distance of star from the sun. This method is good for stars that are within 100 light-years away from us. Fig 1.15. Finding distance of star using parallax. The other method involves using Spectroscope. A spectroscope can break up the light from a distance star into its characteristic colors. There are milestone stars called Cepheid Variables having a regular cycle of brightness with a frequency related to its luminosity. This was discovered by Henrietta Leavitt (1868 - 1921), while observing stars in Magellan Clouds. All stars in the clouds were at the same distance from earth’s point of view but there was an apparent change in magnitudes of some stars. She inferred that any difference in apparent magnitude was related to a difference in absolute magnitude, and that stars having longer periods were brighter than the shorter-period ones. Ejner Hertzsprung (1873 – 1967) carried the idea further and showed that a relationship exists between the colors of the stars and their true brightness. He devised a method called spectroscopic parallaxes of stars to estimates their distances from earth. Since the spectrum of a star is a reliable index of its absolute magnitude, its distance can be inferred from the known relationship between the apparent and absolute magnitudes. The Hertzsprung method was good for stars having distance less than a million light-years. These are the stars within our nearby galaxies. Distance of stars and galaxies further away are derived using a concept called cosmic distance ladder. The idea of the ladder is to start with nearby stars having known distance and calculate the brightness. And then look for similar stars in other galaxies and measure the apparent brightness. Then from the apparent brightness use the knowledge of the real brightness to calculate the distance, and this gives us the distance of the galaxy. Use the brightness of the galaxy to estimate the distance to other similar galaxies, and so on. 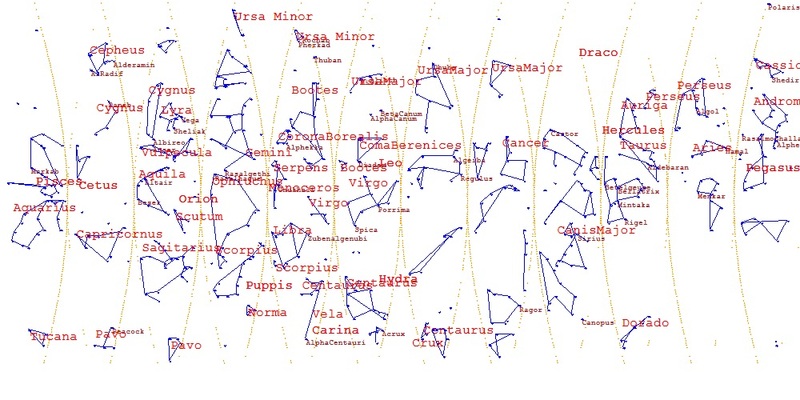 Stars may be identified by their position in the celestial dome. Think of declination and right ascension as extension of latitude and longitude and pointing to a star from earth is the same as pointing to a different location on earth except the line of sight is extended into the sky. Fig 1.22. Local coordinates system. An observer standing at a known latitude and longitude looking straight ahead, can use the Compass north as a starting point. Looking straight ahead, the horizon is defined as an imaginary circle all around, while zenith is the point straight overhead. The altitude is the angle directly beneath the star on the horizon plane and the azimuth is the angle from geographic north to the point directly beneath star. It is also helpful to use the angle between zenith and the star called zenith angle as shown in the Fig. To locate an object in the sky at a specific time, the zenith and azimuth angle with reference to local latitude and longitude must be calculated. Suppose, P is the local reference point with known latitude and longitude and Q is the star declination and right ascension with respect to P. The angle between P and Q is the zenith angle as indicated with red color in the Fig. Extend a line from the center to absolute North (point R) as shown in the Fig. Join P to R and Q to R.
Fig 1.25. Extending the arch from observer’s point P to north R and star’s location Q to north R.
The azimuth angle (RPQ) may be calculated Using the Dot Product Rule (the angle between the two Vectors PR and PQ).